Supports digestion, alleviates the negative affects of antibiotics, and helps combat yeast problems. Maximum digestive support for immune health! 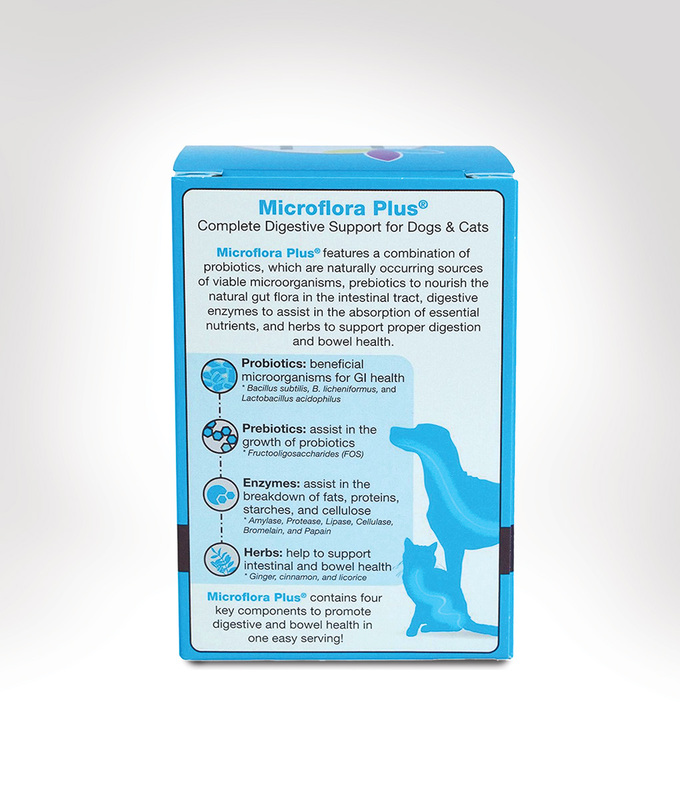 We chose Microflora Plus because it is the complete package (and the top-rated supplement) for helping improve digestive and immune health in dogs. 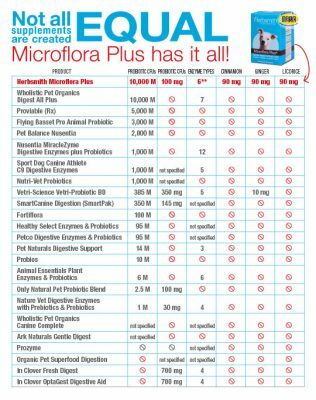 Microflora Plus is the only digestive supplement containing probiotics, prebiotics, digestive enzymes, and gut-soothing herbs. Each works differently to help support and maintain a properly-functioning digestive system. (And the epicenter if your dog’s immune system.) Microflora Plus is safe, all natural and there are no side effects. 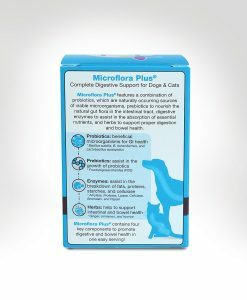 Herbsmith’s Microflora Plus was formulated specifically for dogs by a practicing holistic veterinarian. With its extremely high colony forming units (CFU) count and synergistic action, it may deliver more comprehensive benefits than competitive products. It uses better-quality pure ingredients that are inspected by independent laboratories for safety and meets the rigorous NASC certification standards. 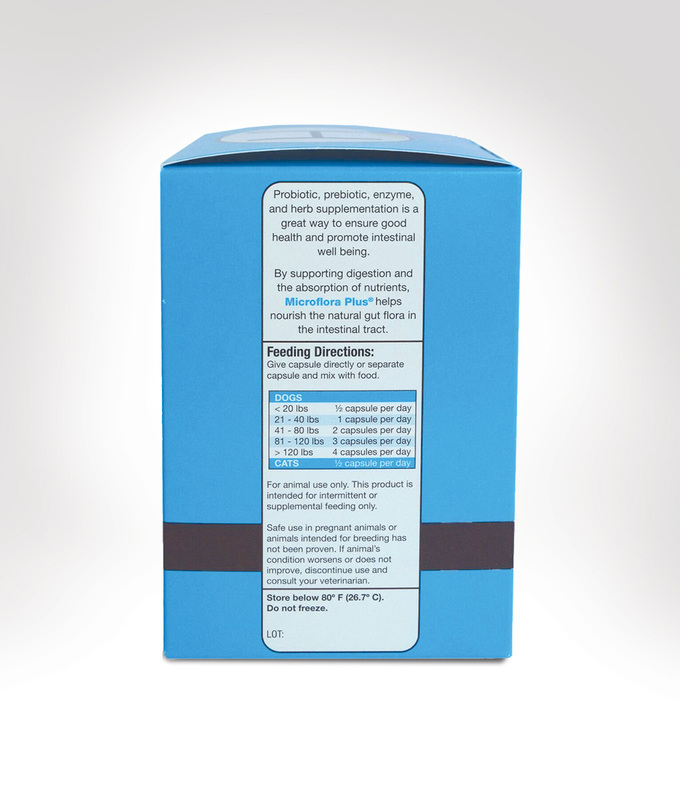 And unlike most digestive supplements on the market, the capsules are packaged in blister packs to seal out moisture and ensure the probiotics remain viable. When selecting a probiotic supplement for your dog, avoid human probiotics and probiotics added to commercial pet food. Probiotics intended for human use are developed specifically for the species of bacteria found in a human’s GI tract human. Pets have specific strains of bacteria unique to them. Pets they do best with a customized supplement formulated just for their needs. Probiotic organisms must be live and able to reproduce to repopulate, balance and help heal the gut. Processed pet foods containing probiotics and other health supplements aren’t worth the money. Tests on dog foods claiming to provide beneficial properties and probiotic microorganisms show the manufacturing process destroys them, killing too many live bacteria and rendering those remaining useless. Whole-food diets (ideally fresh) that are nutritionally balanced are ideal. Another very beneficial supplement to promote healthy digestion in your pet-specific digestive enzymes. By the time the food is packaged and shipped, the good-guy bacteria is useless. Dried fermentation products of Aspergillus oryzae, Rhizophus oryzae, and Trichoderma longibrachiatim [T. reesei], pineapple stem, papaya), FOS (fructooligosaccharides), cinnamon bark, ginger, licorice, dried Lactobacillus acidophilus fermentation product, [dried fermentation products of Bacillus subtilis and B. licheniformis, maltodextrin, sodium silico aluminate (desiccant)], stearic acid.